★★ MUST-HAVE KITCHEN SET - Set of 2 bamboo cutting boards perfect for every food prep need, the extra large one measures 18 in x 12 in x 3/4 in, providing engouh space and strength for heavy duties, the medium one measures 11 in x 9 in x 3/5 in that great for serving up appetizers or make fruit salad. 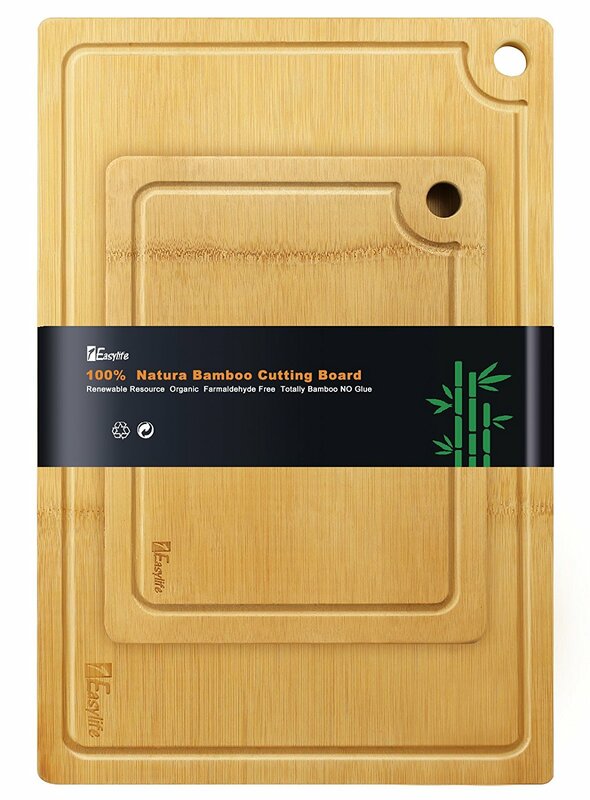 ★★ 100% TOTALLY BAMBOO MANUFACTUR - Unlike other bammboo cutting boards glued with bamboo strips, it’s constructed from totally natural bamboo with no glue, stains or finishes. Seamless surface means there is no porous to grow bacteria and won’t crack or split compared to other Stitching boards. ★★ ALL-NATURAL AND ECO-FRIENDLY KITCHEN TOOL - As we know bamboo is the most renewable resources in the world, our cutting board made of all-natural Moso bammo which is organic and chemicals free. It’s not only eco-friendly to the environment but also gentle to your knives, so never worry it will dulls your knives. ★★ 3 ELEGANT DESIGNS FOR YOUR CONSIDERATION - We are concerned about all the problems that our customers are concerned about. That’s why the cutting board featurs so perfect details. 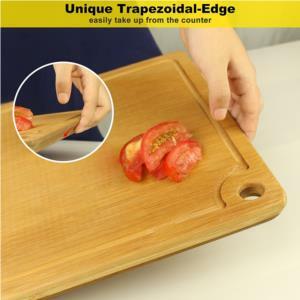 ★ The unique Trapezoidal-Edge design, makes it easily take up from the counter. 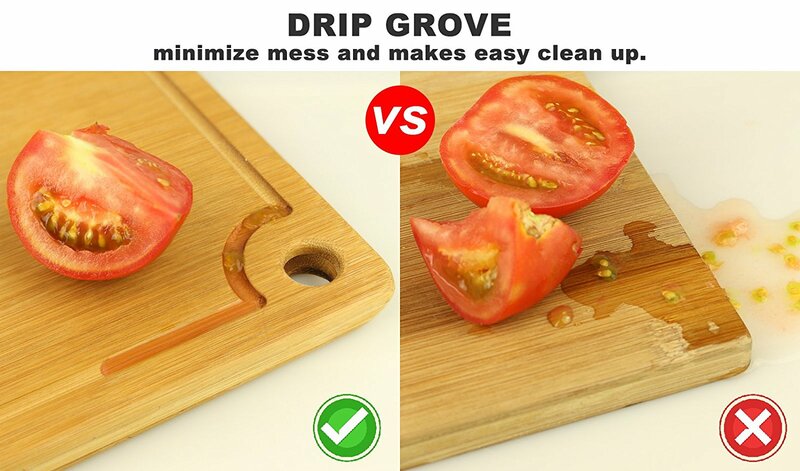 ★ Thanks to the drip groove, there is no more mess or juice after serving cooked meats. ★ There is a rounded built-in handle which is no rust and never falling off compaired to other metal handles. ★★ VERSATILE AND EASY TO MAINTAIN - Reversible surfaces allows you flip the board to the smooth side to serving as tray or platter. 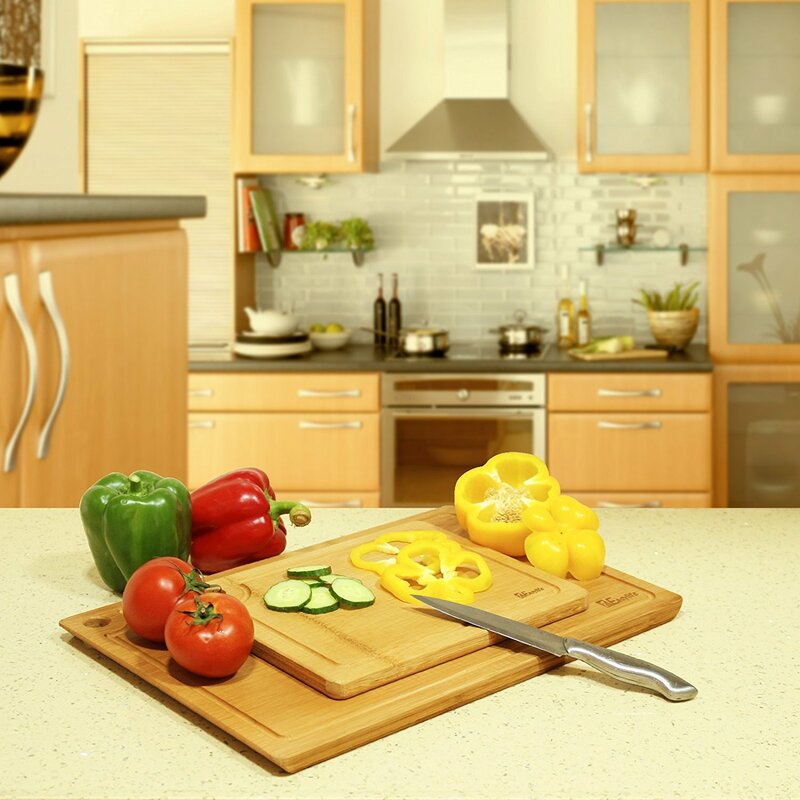 You will love this cutting board for the easy maintaining, just wash with warm water and soap and air dry. Periodically rub with mineral oil to extend lifespan of the board. Are you still worried about there is no extra cutting board when you preparing a feast? Are you looking for a cutting board that won't warp or dull your knives? Do you want a new kitchenware that is health, durable, effective and eco-friendly? 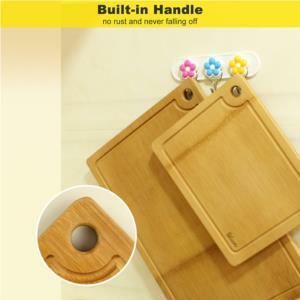 1Easylife 2-piece premium bamboo cutting board set would meet all your expectations. A thick and Large one with groove guaranteed to handle all heavy duty choping, a lightweight and medium one with built-in handle provide a perfect using for fruits and vegetables. 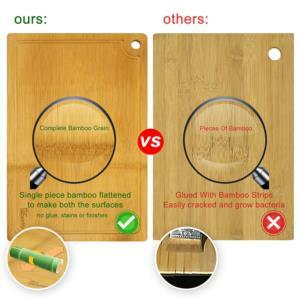 What makes 1easylife bamboo cutting boards apart from the rest? ★ Constructed entirely from organic bamboo with no glue or pesticides, Seamless surface makes it's no porous to grow bacteria and won’t crack! ★ No dyes, pesticides or other harmful chemicals to contaminate your food. 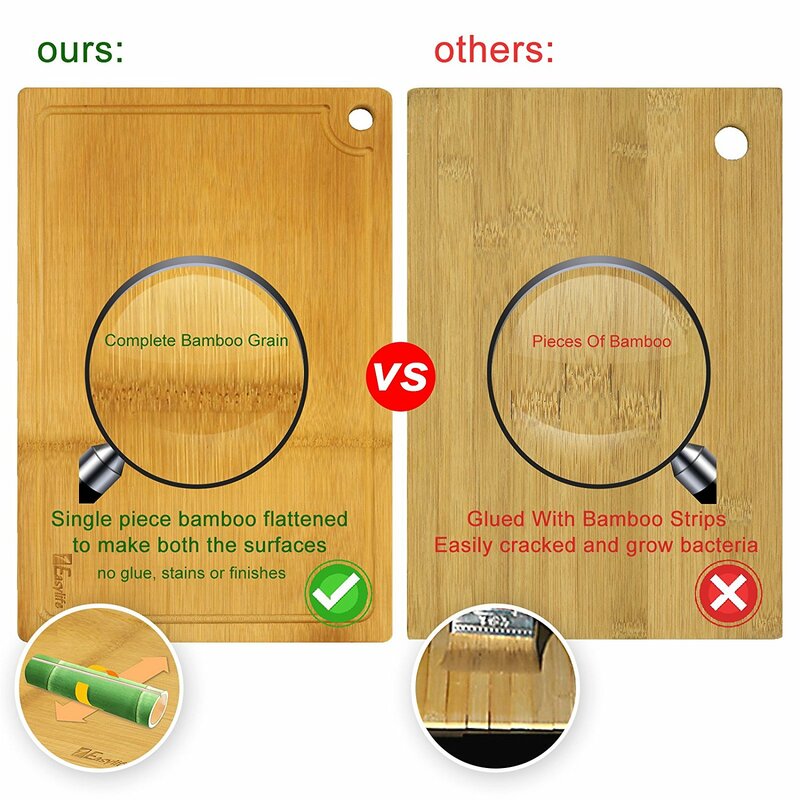 ★ Thanks to the bamboo’ natural benefits – strong, durable but gentle to your knives, never dulls the knives even after thousands of hours of chopping meats or vegetables. ★ The Reversible surfaces allows you flip the board to the smooth side to serving as tray or platter. 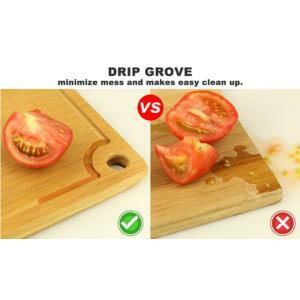 If the board is not used within a long time, season it with food oil, air dry, seal it with plastic wrap to make it isolate from moisture in the air, so as to better protect the cutting board and prevent mildew. Click the Add to Cart Button to Order It! It measures 17 1/2" x 12" and is about 3/4" thick. I really love mine! Can this be washed in the dishwasher? Since material is 100% natural bamboo. So hand wash only, not dishwasher-safe. It is very easy to wash and clean them, just wash with warm water and soap and air dry. Periodically rub with mineral oil to extend lifespan of the boards. Hi. Where is this made? Thanks. We are proud to use premium bamboo which is harvested from our bamboo forest in Southern China. Since material is natural bamboo, it is rust free and chemical free. No dyes, pesticides or other harmful chemicals to contaminate your food. Also eco-friendly to the environment. Seamless surface means there is no porous to grow bacteria and won't crack or split compared to other seller's stitching boards. I’m one who really appreciates kitchen tools and utensils that are well-built from solid wood. I still have (and use) a heavy wooden spoon and cutting board that my father hand-crafted when I was a child. My husband is also a decent craftsman, so I guess what I’m saying is that I recognize quality (or lack of quality) when I see it. This board is really a fine piece of craftsmanship.It measures about 18” x 14” and has 3 layers to make it about 2/3” thick. It has a decent-sized groove all around the edges on one side to catch drippings. The other side is smooth and would look really classy for a meat and cheese tray. There’s a round handle carved into the wood in one corner.The description calls it a “trapezoidal-edge” design, which basically means that the ends are at an angle, well, like a trapezoid, making it easy to get your fingers under the board to pick it up. It’s heavy and solidly built so that it doesn’t slide around on the counter while I’m using it.The first thing I did when my board arrived was to wash it with a little water and soap, and then season it with coconut oil. I repeated the oil treatment a couple of times before I first used the board. I only wash the board with soap and water if I’ve been cutting meat, otherwise I just brush it off. I always rub a little oil back into the board if I’ve actually washed it. This is how I’ve cared for our other hand-crafted wooden tools and they’ve lasted beautifully for a lot of years.And here’s a tip for cleaning your board if it absorbs food odors over time. Just sprinkle your board with salt and rub with half a lemon. Works every time!A complimentary board was provided to me for evaluation purposes, but I was under no obligation to give a favorable review. 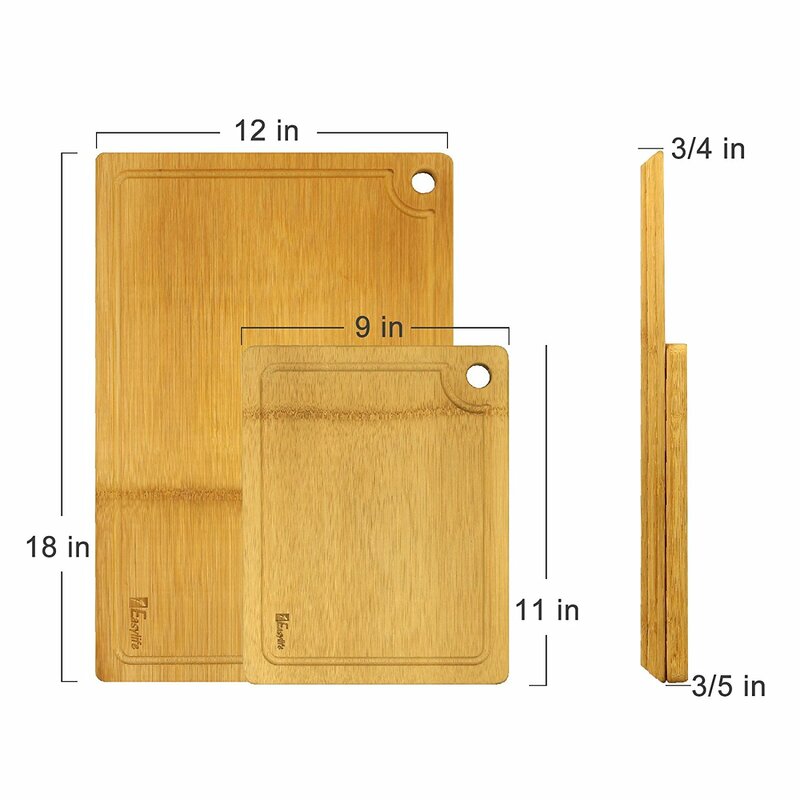 Fantastic bamboo cutting boards that are super sturdy! 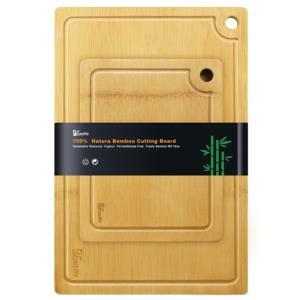 These bamboo cutting boards are super solid and they work wonderfully. There is an extra large board that is 18 in x 12 in x 3/4 in and a smaller board that is 11 in x 9 in x 3/5 in. The larger board is perfect for cutting different vegetables and meats and we love the built-in groove along the side so there are no drips on the counter. The shape of the edge is unique as well in that you can easily pick it up off the counter because of the trapezoidal edge. The flat boards sometimes stick when they are on the counter and you end up having to slide them off.The cutting boards are very nice looking as well and there were no stains on them. We oiled them up with a mixture of mineral and coconut oil and they look awesome and we plan to keep them oiled after every use to extend their life. We also like the fact that they have holes in the edges to hang them neatly in a cabinet. These are better quality cutting boards than we have found in some department stores and we would absolutely recommend them.I received this product at a discount or for free in exchange for my honest and unbiased review. All opinions are 100% my own and I was not paid for this review. I write all of my reviews from a user point of view and do not play favorites so if you found this review helpful, please vote yes below. LOVE, love this Cutting board! !